I am really enjoying watching the summer Olympic Games. The Olympics is the only time I watch sports on television (except for the figure skating, of course). When the Vancouver winter Olympics was on, I was still living in Nipawin, Saskatchewan. Our guild was was trying to plan a winter retreat, and it ended up that only Pat Olson and I could go. We went to a spa for three nights where we swam, soaked in mineral waters, ate, watched the Olympic Games, and stitched. We had a wonderful time, and felt really relaxed and rejuvenated when we got home, as well as quite smug as we both had several finished projects to show off. I know that I can sit and stitch whenever I like and for as long as I like, but sometimes we need to give ourselves permission to do that. The Olympics give me that permission to leave other jobs until later. I can take the time to watch the athletes competing for their country, giving their best performances, while I stitch and stitch. I love it. 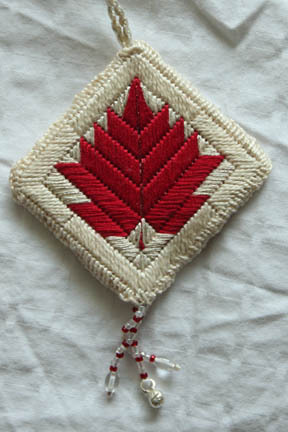 While I watch, I am still working away at those Christmas ornaments I mentioned in an earlier blog - ten of the maple leaf design ornaments from the Winnipeg Seminar 2013 fundraiser calendar. So far, six are complete, and four are waiting to be sewn together. Take a look at that calendar. It's on the DVD Branching Out that your guild received, and it's also on the EAC website . I hope that you, too, will take the time to enjoy the 2012 summer Olympic Games and to stitch. Your maple leaf ornament looks lovely Sue and I should start on a few atc's for the EAC swap soon too. I just looked at the class schedule for Seminar 2012 and the class list looks fantastic. The hard part will be in whittling down all the ones I want to take!